But you can’t go around just knockin’ them down. I still carry these four lines in my heart every day. 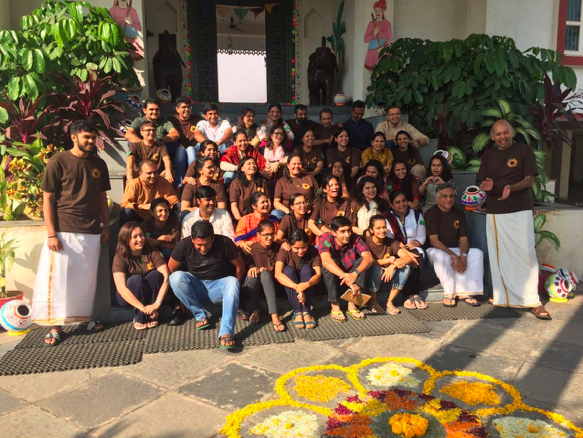 We were welcomed with a warm embrace into the beautiful space, decorated with candles, rangolis and name tags. It felt like a home outside our home. The air was full of Contentment, Smiles, Love and Hope. The volunteers who have been holding this space for all of us were like the pillars of this home and the participants were like their children who were eager to learn. We deeply connected with an expression shared by Shahnaz – “They buried us, they didn’t know we were seeds. Nimo’s songs elevated all of us and gave us a chance to showcase our novice talent to dance with our spirits. The evening was like a house warming party in an unclaimed house which in its true sense felt like our own. Linkee shared a story on how we tend to forget to take charge of our horse, and just rely on the horse to lead us in any random direction. Shahnaz shared how blissful it was, and wished she could carry this feeling of belongingness with her always. Saloni resonated with Shahnaz, conveying her battle to hold this feeling of love in the world that we live in today. Vinita shared a story of Golden Buddha to celebrate the importance of meaningful things in life. Suchiben reflected on how learning to accept herself without judgement has given her eternal peace. The same sentiment mirrored in a quote by Mother Teresa that was shared by Deven, “If you judge people, you don’t have time to love them." Many of us shared personal experiences of kindness. Vijayita shared how celebrating her maid’s birthday gave her a wonderful perspective. Shama quoted how kindness which is the purpose of life is the life full of purpose. Falguni shared her experience of teaching small kids in her neighbourhood. 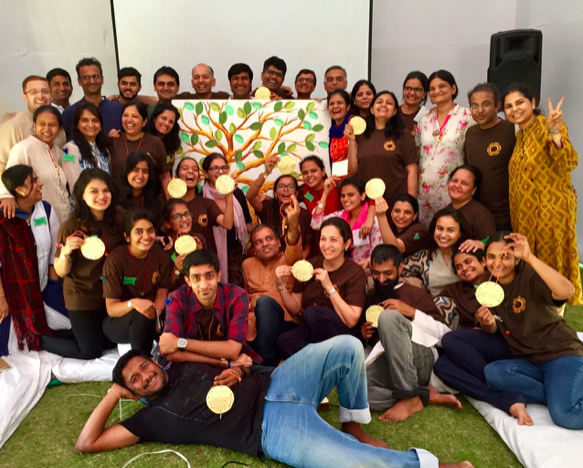 Sneha shared how kindness is not just an act, it has a deeper feeling of peace. Anjali metioned the joy she received when she wrapped all the extra clothes in her house to give away to the needy. Chirag made us laugh with his amusing jokes and Hiral’s exciting mango stories made us all crave for mangoes in winter while Kalpesh bhai’s internal dedication on this journey startled us all. Post lunch, we broke out into four groups for exploring how we can serve in the context of business, parenting, education and new service projects. We brainstormed and presented our collective views along with amazing drawings, skits and poems which made us all see a possibility of a whole new world. Here's a beautiful doodle created by Saloni. Nimisha shared how she believes that our capacity to be more compassionate is always growing while Vinita believes that love can be an answer to all our problems in life. Mirva’s practice of offering chocolates to the poor kids has created a deep connection for her while. Later, we proceeded towards a silent dinner which was beautifully arranged by all the volunteers. It was quiet and dark where we could hardly see the food, but frankly I have never been so content with food in my life. Our stomachs were full, and our hearts were flooded with joy thanks to Rahul’s amazing songs. He shared stories of Vinobaji and Arun dada which gave us a glimpse into the lives of such selfless people. Rahul Dholakia’s immense love for his family and his stories reminded us of our childhood and made us all giggle. Dravya shared his experience of living on his own and failing numerous times to find a job and still not giving up and how we don’t value things when we have them talking about being choosy about food in his own house while accepting everything that was given to him outside. Mitaben and Jumbish’s team expressed their gratitude for the peace in working for the underprivileged kids and how it has helped all of them grow into a different individual today. The next day started with some amazing dhoti moments where Nipunbhai and Dravya turned up in dhotis with Venkat’s help, which made all of us roll on the floor, laughing :) A sweet gesture to honour Venkat's sincere enthusiasm - he had travelled all the way from Chennai to be with us . The three-steps-and-a-bow experience reminded me of a practice of Dalai lama that Nipubhai had shared– he would bow one level down to the people who would bow to him during visits. Every bow made me feel thankful for something small that I have. Just when we were emotionally overwhelmed, Paragbhai and Mitaben embraced us in a warm “jaadu ki jhappi”. Shahnaz touched our hearts deeply with her poem on the bowing experience. for that green, blue and yellow.. I feel one unified with the force..
After the closing circle, as we were all hugging over goodbyes, I realised how a community of “one” was created. Through this community and the spiritual experiences, we all received a space we shall remember forever. Writing this reflection makes me wonder how easy the volunteers made it all look. I was humbled to know that Dravya flew in all the way from the US, just to serve this retreat. The memorable gathering was possible only through Zeal’s little hearts that she attached to our sleeves, Mihir and Pintu bhai’s silent work, Avni’s humour and Kyari’s eyes where the world was full of hope, Siddhant’s personalised cards, Nipun and Pinal ben’s gracious warmth towards all of us, Deven’s wisdom, Rahul’s songs, Anar ben’s love, Parag & Mitaben’s silent support, Nimo's joyful tunes and Nipun bhai's radiant presence. "a) Talking is rare – Just a conversation where one could speak without being interrupted, share without worrying about judgment and be received wholly regardless of who and what they were was the most healing balm for the soul. 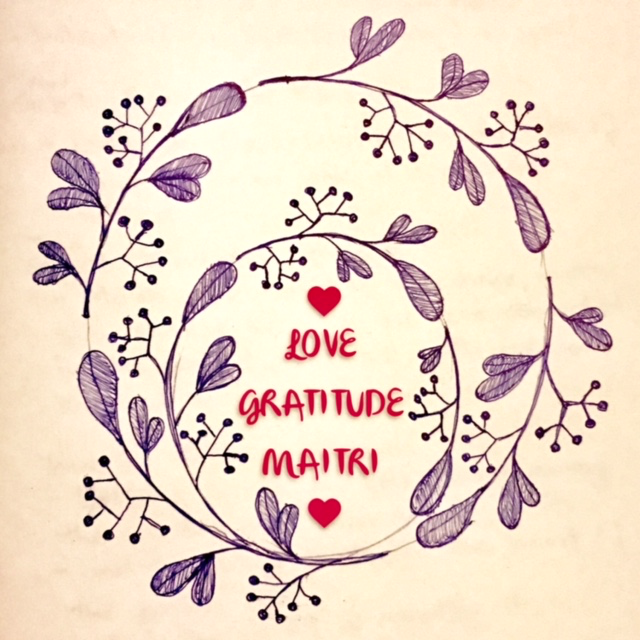 d) Radical Generosity & Courage – It takes immense amount of courage and generosity to host, execute and attend the retreats as vulnerability and receptivity are the only prerequisites… generosity and gratitude, the only outcomes." After being immersed in this field of love for two days, I believe all we need is love and all we can give is love - reminds me of a beautiful quote by Amrita, “Every action we take is either out of love or in the want of love." Beautifully written ... and though the feelings of oneness which all of us felt can never truly be expressed in words , however these moments you have captured can help us relive those times again and again! Beautiful sharing beautifully captured. And love the poem by Shahnaz. we love the share and artistic aspect.